Steven (Chicagoland, United States) on 21 March 2017 in Business & Industry and Portfolio. 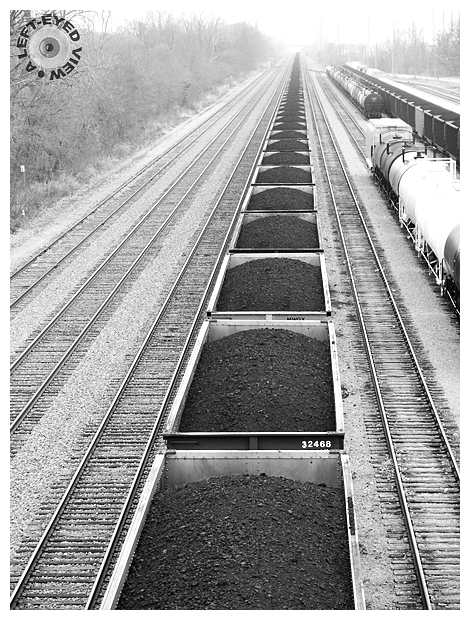 Boxcars filled with coal wait to be taken into the NRG Power Plant in Waukegan, Illinois. Photo captured January 22, 2017.
a superb view here ! Quelle perspective et contraste quelle profondeur merveilleux. A fantastic perspective with these cars reaching into infinity. Too bad we have to generate power with coal. That is a very impressive coal picture. It's amazing the amount of coal needed to feed the plant. A picture impeccable, in graphic terms. The black and white worked perfectly. such beautiful angle, DOF & perspective! Excellent composition with such sense of depth. A fantastic image. The coal cars just disappear into infinity. That is a lot of coal and a very long train. Wonderful black and white image! Great example of one point perspective with the lines going to the vanishing point. I could have used this shot in my art classes. That is really nicely shot. Terrific composition. Une image des plus graphiques j'aime beaucoup ! Excellent image. Very great perspective. Well done ! Awesome perspective and excellent monochrome presentation!